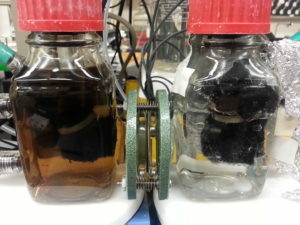 Electrochemical Removal of Hydrogen Sulfide from Biogas. 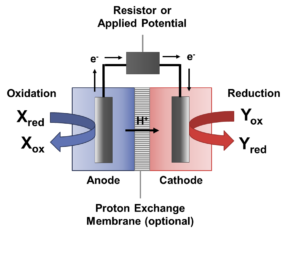 The objective of this research is to develop a system that scrubs hydrogen sulfide from gas and biogas sources using electrochemically promoted precipitation with simultaneous energy recovery in the form of hydrogen gas, H2. Combined Wastewater Oxidation, Energy Recovery and Nutrient Recovery. 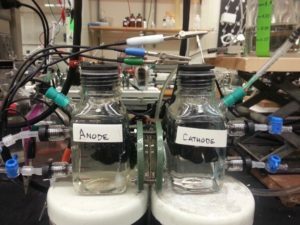 The objective of this research program is to develop and test an integrated bioelectrochemical system (BES) and membrane separation system for simultaneous organics oxidation, biogas upgrading (energy recovery) and struvite precipitation (nutrient recovery) during wastewater treatment. In addition to assessing performance of the system, the microbial communities and their response to stressors will be analyzed. BES Biosensors. The objective of this project is to compare “living” biosensors, in which specific microbial communities or genetically modified bacterial species are used to catalyze the target reaction, with “non-living” biosensors, in which immobilized enzymes are used as the catalyst. One initial target for detection is the range of nitrogen species (NH3, NH4+, NO, NO2–, NO3–, N2O, N2). If you are interested in working on one of these projects, or if you have a related project idea of your own, please contact Dr. Dykstra to set up a time to meet and discuss the possibility of working on these exciting new projects.